Something I've not seen mentioned yet on the various sites I've already visited today is the issue of Aperture's compatibility with Time Machine. I seem to recall there was some sort of an issue with Time Machine corrupting Aperture databases when Leopard first came out. Was that solved already and I just missed it? Is it solved with Aperture v2? Surely it's not still an issue?? First, you should take a close look at both Aperture and Lightroom. Both have demo versions. Aperture is now $199. As for Time Machine, it doesn't corrupt your Aperture library, but I wouldn't use it for that purpose. Use Aperture's Vault system for incremental backup. It's better suited to the task. As an Aperture user who doesn't yet own one of the somewhat-recently-released Nikons or Canons, I'm disappointed in Apple's decision to only support the D300, D3, and 1Ds Mark III only in Aperture 2. 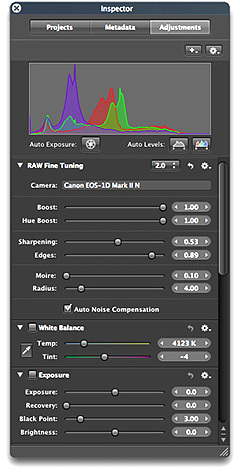 Aperture 1.5 was the current version of the software at the time these cameras were released, and remained so for a couple months. Adobe managed to add support for these cameras to its current software line, and did it in a timely manner. The people who owned these recent cameras were left hanging by Apple. I'm going to stick with Aperture 1.5 until I replace my camera - then I think I'll see what Adobe's offering at that point. If Aperture 2 doesn't blow it away, I'll probably switch. I prefer Aperture's workflow, but - and it surprises me to say this - it looks like Adobe is going to be much better in the support department.